Poligon takes its residency inside the former Tobačna Ljubljana tobacco factory. At a time of increasing precariousness, we strive to carry on their tradition of providing social security to the working class. Besides postmen, policemen and firemen, the women workers at Tobačna were the only other community to receive pensions. Employment at Tobačna was a sole opportunity for emancipation of women, because it was the only factory with child care. Poligon’s agenda is to empower younger generations, who are left with no choice but to become self-employed. If you’re isolated at home, you’ll find it is much more difficult to work or find new projects. We believe that by integrating in a community of diverse creative individuals, new opportunities should arise naturally and with only a little bit of mutual support. Poligon is a creative centre. Established on grounds of the coworking work method and enhanced with very diverse additional content, specially designed for its full-time and part-time users – Poligon Residents. A membership at Poligon offers daily, multi-day and monthly membership passes, which provide access to all its infrastructure. 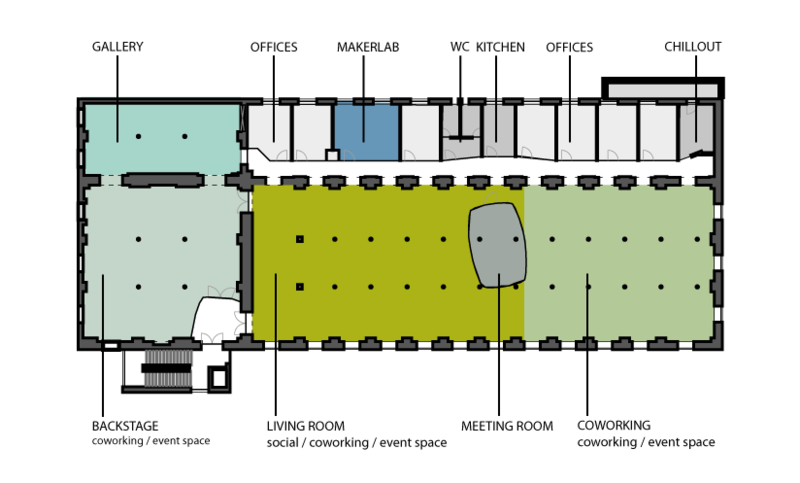 The space is also available for events, workshops or gatherings.